"...And although this release of episodes is indeed colorized as we've become so accustomed to, WB has restored the original opening and closing credits and music as well as portions of the original laugh-track." I always thought that the series was filmed in color from the very start, but that it wasn't broadcast in color until 1964. 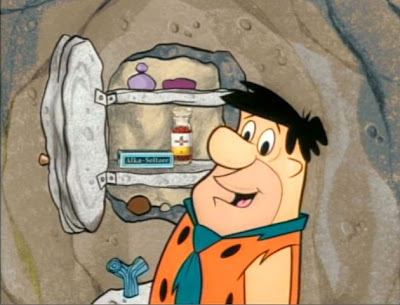 Indeed, The Flinstones (as well as with the entire H-B output) was filmed in color from the very start (including the Flagstones pilot), but it wasn't televised in color until the fall of 1962, when ABC began broadcasting some filmed programs in color. However, it wasn't until the fall of 1966 when ABC had its entire prime time schedule in color, with some daytime programming telecast in black-and-white until mid-1969 or so. I find that very hard to believe because if you watched that video I posted a link to, all those things that were in the original show opening/closings would have been the DVD releases of the show if WB really restored it but instead, they used the changed opening/closings that were shown in the reruns of the show on CN and boomerang. those original opening/closings aren't publicly available on DVD or shown on TV anymore, so it's a rare glimpse on how the show originally aired that you probably won't see anywhere else. Cartoonfanatic201 wrote: I find that very hard to believe because if you watched that video I posted a link to, all those things that were in the original show opening/closings would have been the DVD releases of the show if WB really restored it but instead, they used the changed opening/closings that were shown in the reruns of the show on CN and boomerang. those original opening/closings aren't publicly available on DVD or shown on TV anymore, so it's a rare glimpse on how the show originally aired that you probably won't see anywhere else. The show, and the openings were filmed in color. But back then a lot of cities didn't even have three TV stations, and ABC was usually the odd network out, reduced to trying to get stations in those smaller markets to bump low-performing NBC or CBS shows once a night for one of their higher-rated series, even if it ran 3-4 days after it had aired in the larger markets. Because of that, and full ABC affiliates who for whatever reason weren't showing the episodes the night they went out over the coaxial cable, so called "bicycle prints" were struck in black & white, to be shipped to the affiliates to run on a time-delayed basis. That's what you're seeing here, and what you saw in the B&W excerpts from "The Bugs Bunny Show" on the Golden Collections. Those were the B&W prints struck to be shipped out to the affiliates (since there was no point in ABC footing the bill for color negative prints if the affiliates only had B&W telecine equipment), and many of those prints have found there way into the collectors' markets. So what you're seeing it how viewers watching the show time-shifted back in 1960-62 saw it; if you were watching it in real time back then, there were a few things left out (such as the ABC Network identifier at the end of most of the B&W bicycle prints). Was the "Winston" cigarette advertisement on all episodes, or just some of them? I can understand why nowadays commercials are now seperated from the show, it must have got tiring changing the starting line everytime you needed to advertize something. 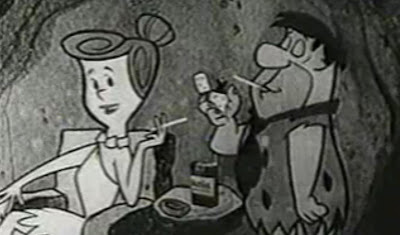 looneyboy wrote: Was the "Winston" cigarette advertisement on all episodes, or just some of them? Miles Laboratory was the alternate sponsor at the outset, as far as I remember. Fibber Fox wrote: Miles Laboratory was the alternate sponsor at the outset, as far as I remember. You're right, and here is the proof: http://www.youtube.com/watch?v=85y2cwNU1zo&playnext=1&list=PLB28C24864E665732 A variant of the intro with an Alka-Seltzer plug. this is the way the Flin stones originally aired on TV. Unfortunately, this hasn't been restored yet on to DVD or what not. I remember that start in the UK (without the cancer sticks at the end) and may have some episodes like that on VHS somewhere. São Paulo - SP, Brazil, August 10, 2011. Hello, fellas from GAC and HB-fanatics from the Americas and the whole world! - Winston cigarettes (from R.J. Reynolds [nowadays manufactured by British American Tobacco]), which was one of official sponsors from the 1982 FIFA World Cup (held in Spain). This cigarette brand was sold here in Brazil during the 80s and recently returned to be sold in my country. 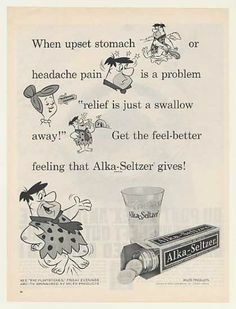 - Alka-Seltzer (from Miles Laboratories, which was purchased in the 90s by Bayer Schering Pharma), which during many years was sold here in Brazil. It sponsored the 1974 (held in Germany), 1978 (held in Argentina) and 1982 (held in Spain) FIFA World Cup. - Welch grape juice and grape jam. - Post cereals (from Kraft-Mondelez Foods). 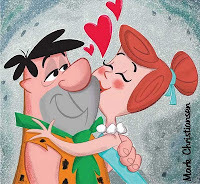 Fred and Wilma, two pidgeons in love, in a wonderful illustration made by Mark Christiansen (http://www.markscartoonart.com). Last edited by rodinei1964 on Tue Aug 22, 2017 8:01 pm, edited 1 time in total.